Since Saturday, I’ve been acting as the city’s best tour guide - at least in the eyes of my mother and father in-law. We’ve been running all over Istanbul and using all sorts of transportation - taxis, otobus (city bus), tramvay (an electric tram), metro (subway), vapur (ferry boat), dolmuş (a group-like taxi van) and our feet. I am exhausted at the end of the day, but happy to show off my city and visit with family members. They are visiting us for the next two weeks, so I may not be blogging as often as I usually do. One overcast morning, I took Mary and Tom to the top of “Europe’s tallest building” - the 236-meter-high Istanbul Sapphire. This is the tallest building located in Istanbul’s Levent main business district and the second tallest building in Istanbul and Turkey after the Diamond of Istanbul. Constructed by the Kiler Group, Istanbul Sapphire is at 368 meters above sea level. Some of the many skyscrapers that make up the business district around Levent. Last month, I had briefly visited the building to meet a friend for lunch. The bottom floors include many restaurants, some small grocery stores and typical shopping mall stores like H & M, YKM, LC Waikiki and Mavi while the top floors are luxury residences. We took an elevator to the building's 54th floor. Then, we reached the 56th floor by climbing up stairs to access the top observation deck. I have to say the view is pretty impressive! I zoomed in on the mosque down below. The day was slightly overcast, but you can see the Bosphorus in the background. You can see why Istanbul is so crowded. Most residences are topped with these red-tiled roofs. If you are in Istanbul, I’d highly recommend setting aside an hour to see the city from a different viewpoint. Here are my happy in-laws with the many buildings of Istanbul behind them. View of the first bridge - that connects Europe and Asia together in Istanbul. The Turkish flag flies on top of the Istanbul Sapphire. View of the second bridge - also known as the F.S.M. Köprüsü. 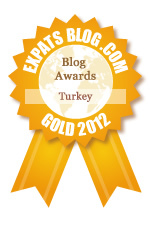 For more photos, take a look at these professional shots by Istanbul Blogger. Take the metro to 4Levent. Take the çelektepe exit, turn right and follow the signs for the Istanbul Sapphire. The ticket office is on the first floor. Admission is 15 TL for adults. That is so fantastic! I am going to have to put this on my list of things to do! We are definitely going to have compare "tour guide" notes! Love, Love! Ohhhh,that is one high building. That top photo almost made me go dizzy. :) Amazing views though. we might have to try and make it here next time we're in Istanbul. Yes we had a great time and in-laws were impressed. If you have time, I'd recommend it! Beautiful! My friends were just telling me how wonderful Istanbul is to visit.